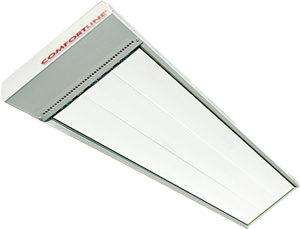 The Comfortline brand offers a range of sleek and modern European overhead heating solutions. Comfortline heating panels are the ideal for hard-to-heat areas in indoor and outdoor environments. This modern form of electric heating emits a gentle, lasting radiant heat that offers up to 10% more usable energy than similar panels. The radiant surface is designed in sections of naturally anodised aluminium, set in a galvanised steel case for strength. The panels are plastic powder-coated in white, giving them a sleek and attractive modern appeal (other colours are available by special order). Comfortline panels come in one, two or three panels. We offer 5-year warranty on Comfortline Excel and Terrace Heater and a 2-year warranty on Comfortline Original and accessories. Why Do Heating Panels Outperform Traditional Heating Systems? More traditional heating sources incorporate the use of forced air heat – air is heated remotely and then transported to various destinations via conduits or ducts. Obviously, much of that energy will be lost during transportation and through the doors and windows. Less dust particulate movement – reducing reactions such as asthma, allergies, mucous membrane infection, etc. The most significant advantage to Comfortline panels is the ability to control heat to specific spaces quickly. You simply enter a room, switch on the heat and turn it off when leaving. If hot air rises, doesn’t all the heat from radiant heating panels gravitate toward the ceiling? No. 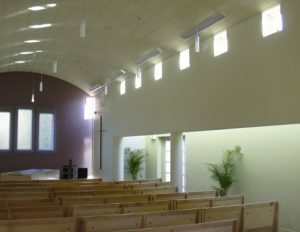 The reason for this is that radiant panels do not emit heated air, just heat. Like the heat of the sun, they surround you with comforting warmth. 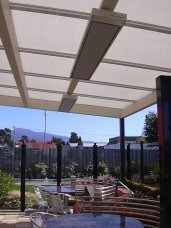 Comfortline offers high quality, European-made outdoor and indoor electric overhead heating panels and accessories. These are supplied in Australia exclusively through Devex Systems. You know the feeling of emerging from beneath a cool, shady tree into the warmth of the sun? That is the effect of radiant heat. It feels different than any other heat because it is quick and constant. Comfortline heaters use the latest development in radiant heat technology to warm virtually any environment. This includes outdoor heating such as patios, and indoor heating such as bedrooms. These heaters offer unparalleled comfort and adaptability as well as easy installation. Unlike most other heating components that require infrastructure modifications, Comfortline panels can be easily mounted on most existing ceiling configurations. A fast, efficient, and silent option for difficult-to-heat areas. Inconspicuous designs, perfect for recessed or surface ceiling applications. Radiant heat, supplementing or replacing traditional forced air systems. Invisible heat for residential use when ceiling foils are used. Delivering heat much the way the sun does, Comfortline ceiling mounted panels provide luxurious warmth and offer significant savings when compared with bottled LPG gas heaters and other forms of traditional heating. Comfortline radiant heating panels offer the obvious solutions to all of your heating problems. Silent, clean, safe, comfortable, hypo-allergenic, cost-effective, space-saving, and maintenance-free! 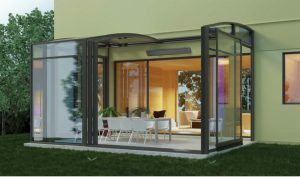 Indoor and outdoor environments including: offices, factories, warehouses, workshops, garages, schools, churches, colleges, cafes, restaurants, nursing homes, hostels, community halls, shops, homes etc. Comfortline heating panels are the ideal heating solution for hard to heat areas in indoor and outdoor applications. This modern form of electric heating emits a gentle, lasting radiant heat that offers up to 10% more usable energy than similar panels, saving YOU money. The most economical heating solution for hard-to-heat areas, Comfortline Panels are available in a wide range of sizes and heating outputs. Comfortable, cost-effective heat can be a challenge outdoors. Radiant heating panels are the obvious solution. They create opulent environments for all outdoor venues, even during cold winter months. “…we are very happy with the end result in the alfresco areas of our cake and coffee shop.” – Nick Poupouzas, Oakleigh Quality Cakes Pty Ltd.
Comfortline panels emit up to 10% more usable heat than similar panels. This additional heat output is a result of our unique “Silicating Treatment” on the heating surfaces. Simply put, the surfaces are roughened, which increases their surface area and thus their capacity to radiate heat. The high level of insulation increases efficiency and aids in eliminating vibrations. Radiant outdoor heating panels from Comfortline provide the most comfortable answer to the challenge of heating exterior gathering places. With many interior spaces, such as warehouses or places unusual architectural configurations and vaulted ceilings, the ability to sensibly position heat is paramount. Can you imagine the energy savings you might achieve by reducing the building thermostat 5 degrees and providing comfortable heating panels for the stationary staff? If you want maximum productivity from your organisation, their personal comfort is in your best interest. It is imperative that your patrons are comfortable to ensure repeat business. Rather than guessing at the right configuration for your indoor heating needs.  Contact us today for a professional estimate of the proper size, spacing, and heating output levels required for your construction project. If you have a space that is heated inadequately, Comfortline Panels are the simplest solution. Installation is easily accomplished without tearing up walls and floors. They can be installed in virtually any ceiling height ranging from 2.4m to 8m plus. We provide a 5-year warranty on Comfortline Excel and a 2-year warranty on Comfortline Original and accessories. Comfortline is a name that is synonymous with quality and reliability. We have been providing distinctive heating products since 1978. Comfortline heating panels are the ideal heating solution for hard-to-heat areas in indoor and outdoor environments. This modern form of electric heating emits a gentle, lasting radiant heat that offers up to 10% more usable energy than similar panels. The radiant surface is designed in sections of naturally anodised aluminium, set in a galvanised steel case for strength. The panels are plastic powder-coated in white, giving them a sleek and attractive modern appeal (other colours are available by special order). Comfortline panels come in one, two or three panels. We offer 5-year warranty on Comfortline Excel and a 2-year warranty on Comfortline Original and accessories. # Assumes Comfortline Excel 24 with electricity of 25c/kWhr. The Comfortline Excel panels reflect over two decades of manufacturing and design expertise. 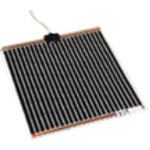 The high level of heat emission is a result of the unique ‘silicating’ treatment on the heating element’s surface. This increases the actual surface area, ensuring the highest possible level of heat emission from the surface of each panel. The panels are packed with ceramic insulation that reduces the heat losses upwards, making them extremely efficient to run. We back this excellence with 5 years’ warranty! With a Comfortline overhead heating solution to suit every application, there is no space you cannot heat! From small pokey areas to large offices and hot yoga studios, there is a heater suitable for all. All of our Comfortline heaters are low maintenance, cost effective to run and non-intrusive – if it weren’t for the comforting heat you would hardly know they are there! Simplified Installation – the new model has been lengthened by 50mm, simplifying the connection to the supply conductors. This provides more space for the terminal and makes the connection of the product to the supply conductors much easier. The terminal is also now accessible from two sides allowing easier installation. Extension of the non-heating part of the heating rod by 50mm. This allows it to extend as far as the terminal, thus eliminating the need to pass the conductors from the heating rod into the space containing the terminal. The Comfortline Terrace heater is our newest edition. With a sleek black surface, these heaters are designed for the zonal heating of winter gardens, enclosed and/or roofed balconies and terraces. Each heater is equipped with tilt-able mounting brackets for wall mounting at an angle, with additional brackets allow grouping multiple heaters for a broader coverage. The minimum height at which the panels can be installed is 1.8m above the floor (the lower edge of the panel), making them the perfect solution for smaller areas. Like the excel, they are cost effective to run, low maintenance and ideal for indoor or outdoor spaces. We also back this with 5 years’ warranty! The Comfortline Slimline panels are designed to be either surface mounted or recessed. They are perfect for smaller spaces such as bathrooms, living areas, offices and bedrooms where you want to achieve direct zonal heating. They can even be installed directly over a bath, pools or wet areas as our 750w model comes in two different IP ratings: 44 and 65. The superior level of heat emission is due to the unique surface treatment on both the inner and outer heating surfaces. The treatment on the inner side is called ‘Thermoquartz’ – this material assures the highest absorption of heat from the heating foil. The outer layer is called ‘Gravely Snow’ which ensures the highest efficiency of emission. We back this heater with 2 years’ warranty! The Comfortline Mirror Heating Foils (also known as ‘demister’) is the ideal solution to eliminate foggy and steamy mirrors. No more wiping or streaks being left on your mirror! These are quick and easy to install and can fit most sized mirrors. They are low maintenance, have low running costs and can be operated via a light switch. 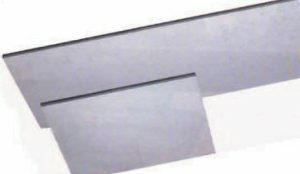 The Comfortline Celling Heating foils are perfect for any new construction or existing homes where access to the space above the ceiling is available. This system can be thermostatically controlled and can easily replace or supplement existing heat sources. It provides “surround” radiant heat that feels wonderful in every room. Consisting of a thin carbon film heating element sandwiched between two layers of high temperature plastic laminate, these foils are positioned to lie directly on top of a plasterboard ceiling, beneath the bulk ceiling insulation. The insulation minimises upward heat losses and directs the heat downward into the room below. These are low maintenance and have low running costs. 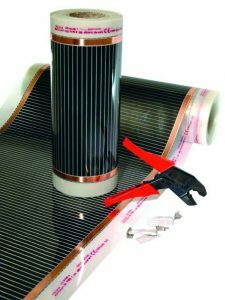 We back these heating foils with 2 years’ warranty!